Mohandes 'Mahatma' Gandhi came to South Africa in 1893 as a lawyer, settling first in Durban before moving to Johannesburg, where he lived from 1903-1913. In 1915 Gandhi returned to India and helped lead the Indian independence movement, advocating for a peaceful transfer of power and freedom from British colonial rule. During his time in Joburg he developed his philosphy of satyagraha, or non-violent resitance. Gandhi's principle of satyagraha greatly influenced the early struggle against apartheid and was adopted by the African National Congress in 1912. It later shaped the anti-apartheid Defiance Campaign, which took place in Fordsburg in 1952, and influenced numerous other peaceful liberation movements around the world. 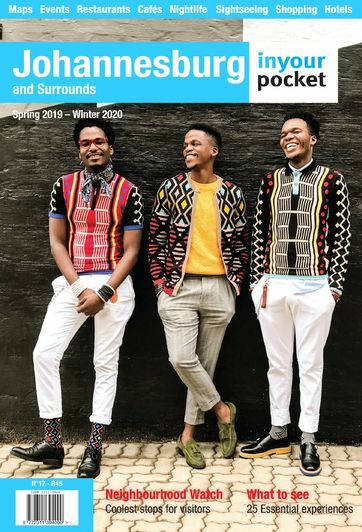 In recent years Gandhi's time in South Africa has come under closer scrutiny with historians questioning his separation of the struggle for the rights of Indians in South Africa and those of Africans. Recently uncovered letters written in the 1890s by a young Gandhi contain passages in which he openly advocates preferential treatment, and in one letter even refers to "African natives" as "savages". 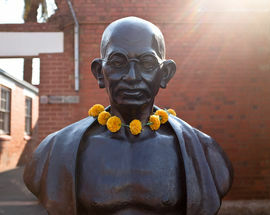 There is no doubt that Gandhi's experiences of injustice in South Africa were one of the main turning points of his life. 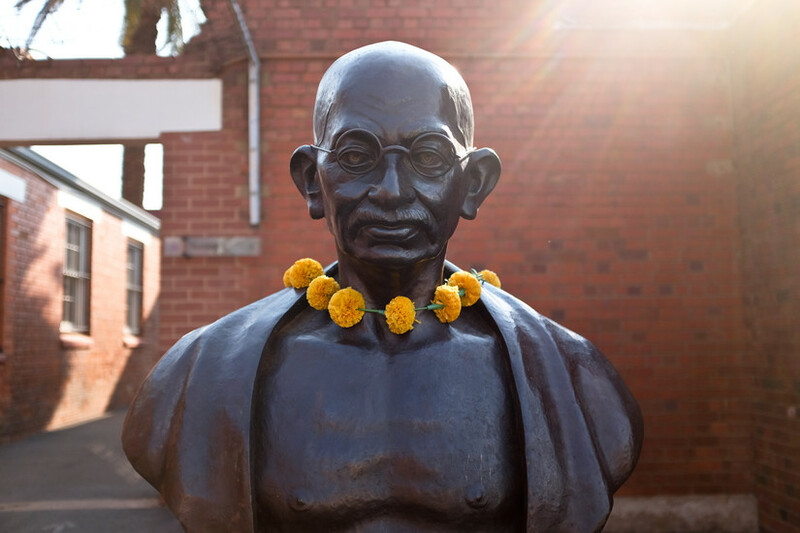 As Gandhi himself said “it was after I went to South Africa that I became what I am now.” While his time in Joburg was brief, there are many places in the city which are dedicated to Gandhi's memory. While in Joburg Gandhi worked as a lawyer. The old location of the city's law courts was renamed Gandhi Square in his honour and a small statue of the young Gandhi as a lawyer looks out over what is now a busy commuter bus terminus. Over time Gandhi became active in the politics of resistance in South Africa. 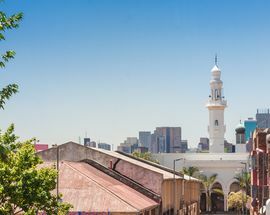 On August 16, 1906, he led 3,000 supporters – among them Muslims, Hindus and Christians – to Hamidia Mosque, in Fordsburg (opposite where the busy shopping bazaar Oriental Plaza now stands). Here they burned their ‘pass’ documents, the restrictive papers forced on all people classed 'non white'. The place is now marked by a sculpture of a potjie (a three-legged cast-iron pot) beneath which is placed a wheel, that when spun produces an image of a pass document burning. Two years later, in 1908, Gandhi was jailed for his refusal to carry a pass book, spending two months in Constitution Hill prison. 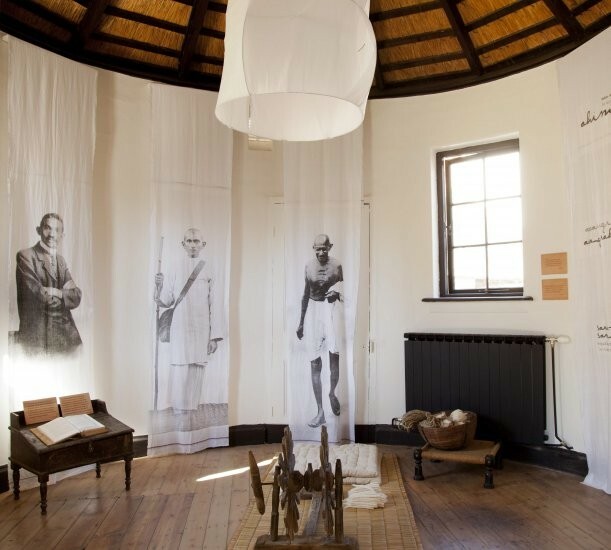 The excellent 'Gandhi: prisoner of conscience' exhibition in Constitution Hill's old Number Four prison block details his experiences of his time in prison and his early activism. Following on from the mass defiance campaign of 1906, Gandhi and other South African Indians continued to defy the authorities. On 27 December 1907 he was arrested for failing to register and staying in the Transvaal. After appearing in court Gandhi was sentenced to two months prison in the Old Fort on Constitution Hill, a space which was rapidly swelling with other Indians who had also chosen to peacefully defy the authorities. Gandhi was eventually released and negotiated an agreement with General Smuts (known as the 'Smuts compromise') to encourage Indians to voluntarily register, in exchange for a repeal of the legislation restricting the liberties of Indian South Africans. It was an agreement which Smuts failed to honour, leading to an increase in the intensity of the satyagraha campaign. Among the many interesting items at the Gandhi exhibition at Constitution Hill are a pair of sandals which Gandhi made while in prison. He gave the sandals to General Jan Smuts in 1914 shortly before he left for India and some 25 years later, a now much more sympathetic General Smuts, returned them saying "I have worn these sandals for many a summer, even though I may feel that I am not worthy to stand in the shoes of so great a man." 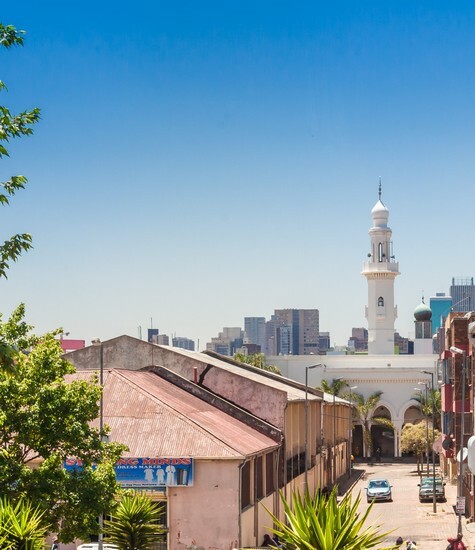 From 1908-1909 Gandhi moved into a modest home in the eastern Joburg suburb of Norwood, living a simple, meditative life and focusing on developing and promoting his philosophy of satyagraha (passive resistance and nonviolent civil disobedience). 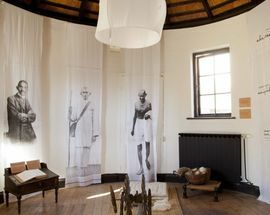 Gandhi lived here with his friend Herman Kallenbach and the homested, that was known simply as The Kraal, is now the Satyagraha Guesthouse and Museum, a beautiful place offering visitors and guests a contemplative and spiritual experience. The building's exhibits include various photos, correspondence, journal entries and beautifully displayed inspirational quotes spread across the various guesthouse buildings and the tranquil garden at its centre.